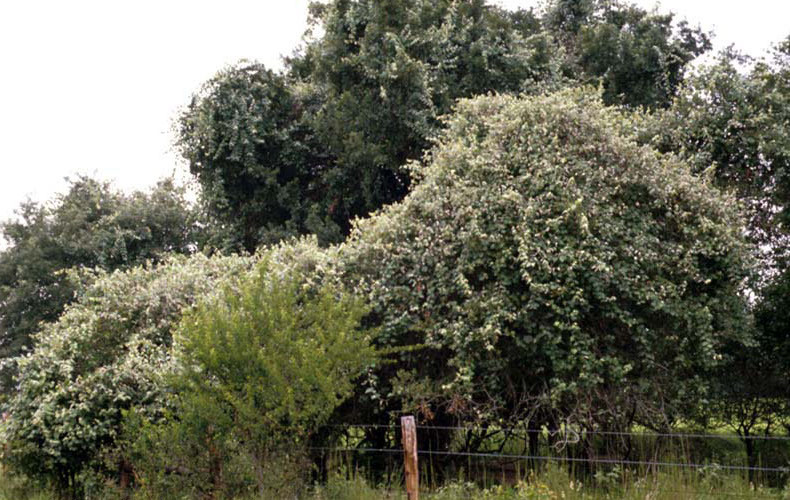 Wild Mustang Grape Jelly is a staple here in Texas because Mustang Grapes grow wild in most parts of Central and South Texas. Mustang grapes have an intense, acidic flavor which make them perfect for this tart, sweet jelly. Mustang Grape Jelly was always served at my Grandma Zett’s house on hot buttered toast. My sister, June, and I could never seem to get enough, and now our families beg for us to make it every summer and keep our pantries stocked up! Because mustang grapes are so prolific in Texas, you’ll find them covering fence lines and crawling up bushes and trees along the side of the road. They’re pretty easy to spot once you know what you’re looking for, and when you find them, load up and make some of this outstanding jelly! You have to be careful when handling these grapes because they are so acidic that the juice can burn your hands and make them feel itchy. It’s not a bad burn, but enough to make your hands itch and drive you nuts! Mustang Grapes are usually ripe and ready to pick in Mid-July and can stay on the vine through August. But pick ‘em when you see that they are ripe and ready or they’ll be gone in a hurry! Many birds and some other critters in our area love to eat them. 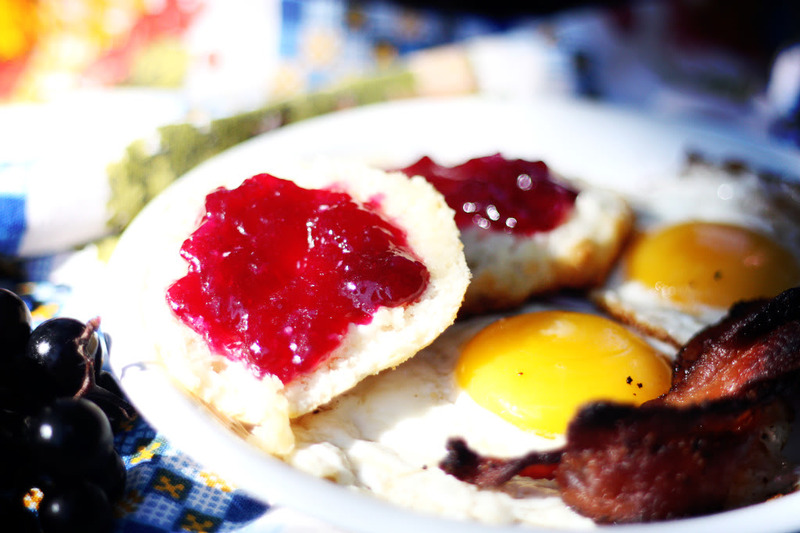 I make this recipe in small batches for convenience and to ensure that the jelly sets. I hope you enjoy this super easy summertime treat! 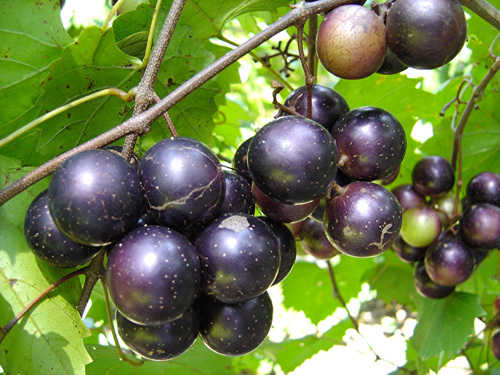 You’ll have grape jelly to last for most of the year. 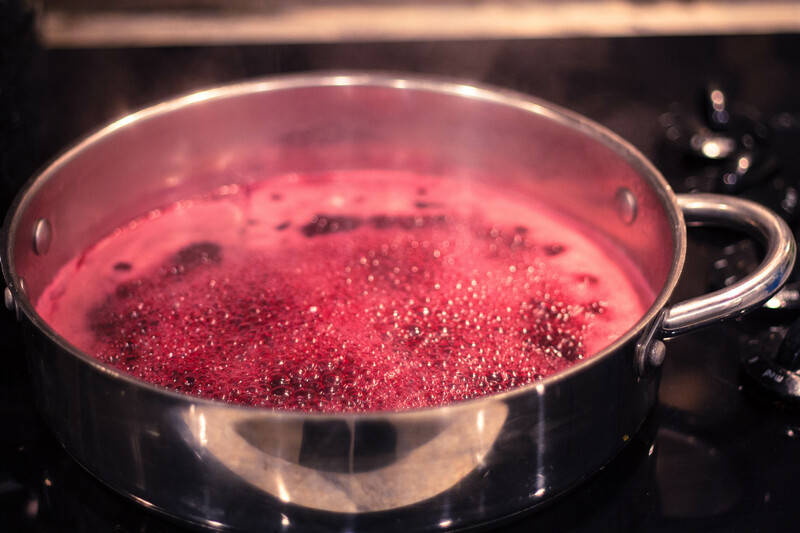 To about 2 gallons of grapes (stems and all – thoroughly washed with cold water), I add ½ cup of water to prevent sticking. 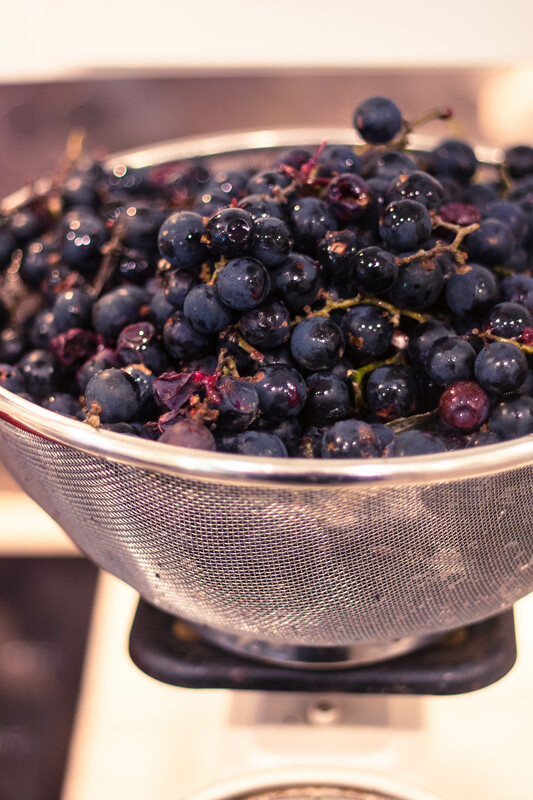 In a large Dutch oven or stockpot, over medium-high heat, cook grapes for about 20 minutes or until skins start splitting and slipping off. Turn heat off, cover and let sit about 20 minutes. Pour juice and grapes through a fine mesh strainer and mash with the back of a spoon to get all the juice out and some of the pulp. Discard all remaining in strainer. Cover and chill in the refrigerator overnight. Measure out 7 cups of sugar into a medium bowl and set aside. In a large saucepot combine juice, pectin and butter. Bring to a full rolling boil (will not stop bubbling even when stirred). Once boiling, add sugar all at once, stirring well to combine. Bring back to a full rolling boil and boil rapidly, stirring constantly for 1 minute exactly. 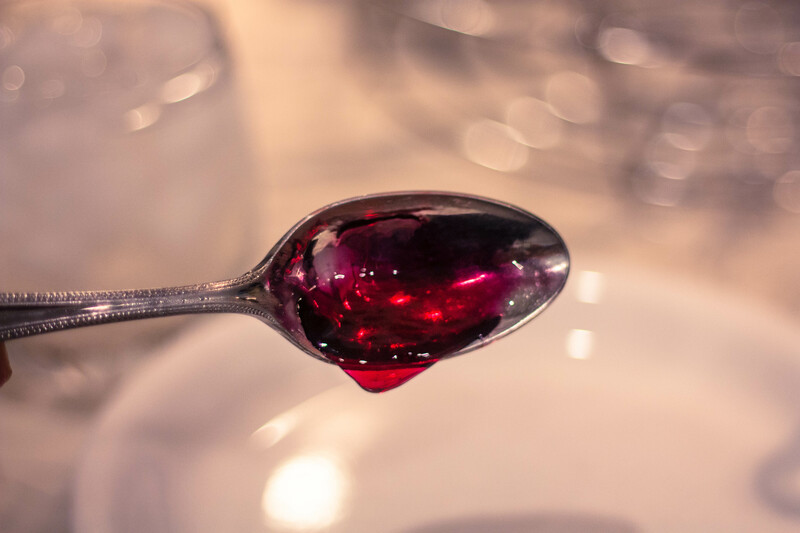 You’ll know the jelly is the right consistency when it begins sheeting off of a cooled spoon. You can also test the consistency by letting a dollop cool on a plate. Once cool, swipe your finger through it and it will not come back together very easily. Immediately remove from heat, skim off any foam and ladle into hot sterilized jars, filling to 1/8 inch from top. Place sterilized tops and rings on jars and tighten rings firmly, but not as tight as you can. Place jars in canner rack and lower into gently boiling water, covering tops of jars by two inches (add more water if necessary). Place lid on canner and continue gently boiling for 5 minutes. Carefully remove jars from canner and place upright on a towel-lined countertop or cooling rack and allow to cool completely. As jars cool you may hear a pop! That’s a great sound, it means your jars are sealing. In a large saucepot combine juice and pectin. Bring to a full rolling boil (will not stop bubbling even when stirred). Once boiling, add sugar all at once, stirring well to combine. Bring back to a full rolling boil and boil rapidly, stirring constantly for 1 minute exactly. Immediately remove from heat, skim off any foam and ladle into hot sterilized jars, filling to ⅛ inch from top. 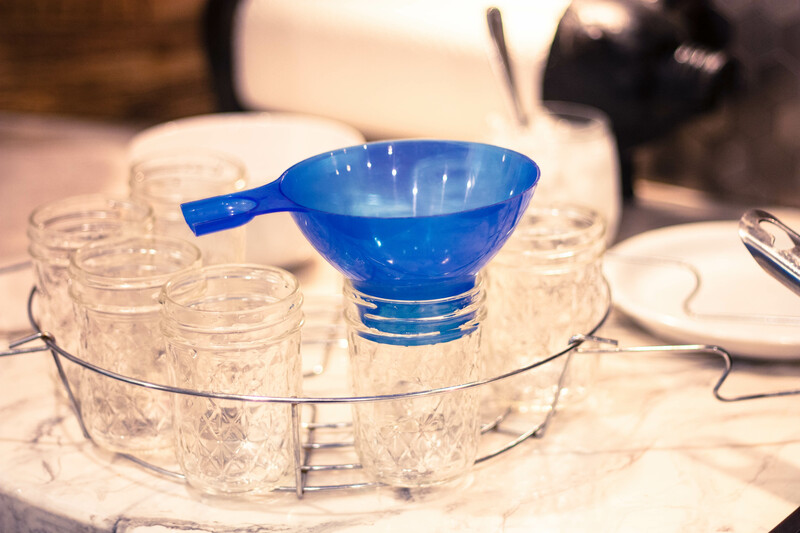 Place sterilized tops and rings on jars and tighten rings firmly, but not as tight as you can. Place jars in canner rack and lower into gently boiling water, covering tops of jars by two inches (add more water if necessary). Place lid on canner and continue gently boiling for 5 minutes. Carefully remove jars from canner and place upright on a towel-lined countertop or cooling rack and allow to cool completely. As jars cool you may hear a pop! That’s a great sound, it means your jars are sealing. After jars are completely cool, check seals by pressing tops of lids. If the lid pops back and forth, the lid is not sealed and you must use immediately and refrigerate. Otherwise, you can follow the Sure Jell or powdered pectin box’s directions for re-processing. That’s wonderful! It’s my favorite jelly. What a great thing to do together…I love working with my mom on canning and cooking projects. Thanks for dropping by and letting me know! Jennifer, Thank you for the recipe!! I am pretty new to canning, food preserving and jelly making. okay, VERY new. I picked quite a few Mustang Grapes, washed, ran them through my Norpro Sauce Master II (with the grape spiral attachment….sold separately) and ended up w/ 3.5 quarts of juice. I have a couple questions!…..
1) is it okay to let the juice refrigerate for a few days before I make the jelly? 2) is it okay to freeze the juice to make the jelly at a much later date if I need to? 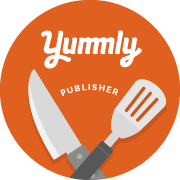 3) how much does your recipe make? I will be wither using either pint or half pint jars. P.S. I LOVE my Norpro Sauce Master II. 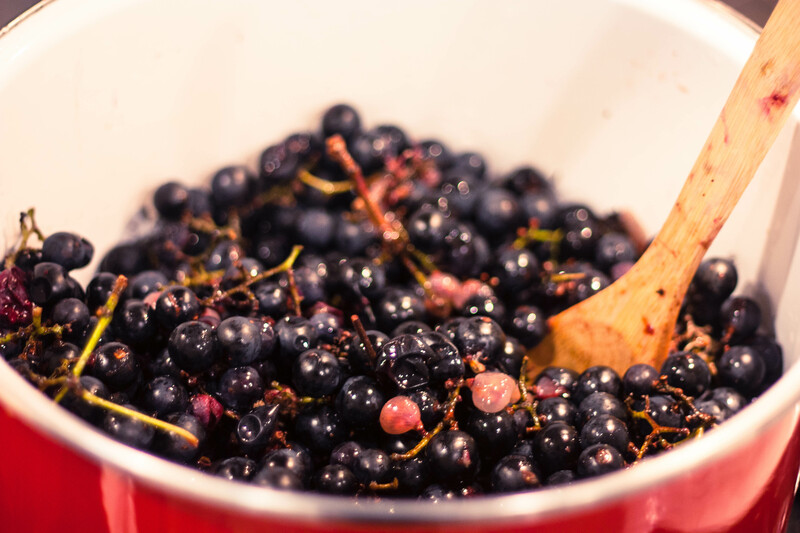 I used it when I made Dewberry Jelly last month (used the berry screen…sold separately). It worked GREAT!! Hi Donna! We’re practically neighbors…I live in Belton, Texas! Yes, it’s okay to refrigerate or freeze the juice and make at a later date. I remember my grandma doing this often. This recipe makes about 8 to 10 half pint jars. You know, I have never used a Norpro Sauce Master…I’ll have to look into that! Thanks so much for dropping by and commenting. Made 2 batches today. Turned out FABULOUS!! Just a pat or two will do the trick! Jennifer we too are practically neighbors. Wild mustang grape jelly is by far my entire family’s favorite jelly. Every August I get as many of the grand children together as I can to help me pick wild grapes and Turn them into Jelly. This is the best jelly ever!! Last week we harvested 4-five gallon buckets… approx. 3.5 gallons of grapes (stemmed) yieldded me 11cups of pure juice. Hi there neighbor! Thank you for reaching out. I have not noticed the butter causing any setting problems. This is something my grandmother would use, however this year I didn’t use butter at all and everything turned out great. I seem to have better luck with liquid pectin for some reason. I was just talking to someone yesterday at church about mustang grape jelly setting soft, and they said that if you add lemon juice to the ratio it will help firm it up. The ratio they use is 4 3/4 cup juice, 1/4 cup lemon juice, and 7 cups sugar. I think I may try that with my next batch, and if it works well and tastes as good then I’ll update my recipe. I remember, as a child, my mother making mustang jelly. The first year it turned out to be syrup which we used all year on pancakes and everyone loved it. Next years batch worked and we had jelly. Still to this day I eat grape jelly on my pancakes as it’s hard to find Mustang Grape Syrup. Hi Patrick! I hope you enjoy this recipe! It’s a multi-generational family favorite! Thanks for this recipe – we are looking forward to trying it! I wasn’t able to find enough half-pint jars at the store for multiple batches (we have a lot of grapes!) Is it possible to make with pint jars instead? And if so, would you suggest adjusting the recipe in some way? Thank you! You can pour the jelly into any size jars that you like. You don’t need to adjust the recipe. If the lid pops up and down, then it has not sealed. It should be refrigerated and used immediately. Otherwise, if it has sealed, then you can tighten the lid. I’m pretty sure they mean don’t tighten the lid too tight before the water bath. The ring should just be screwed on and tightened lightly by hand. If it’s over tightened before the processing then it can cause the lid not to seal due to over pressurizing, I believe. Interesting, but I have not used a water bath when making jams and jellies for probably 35 years now. 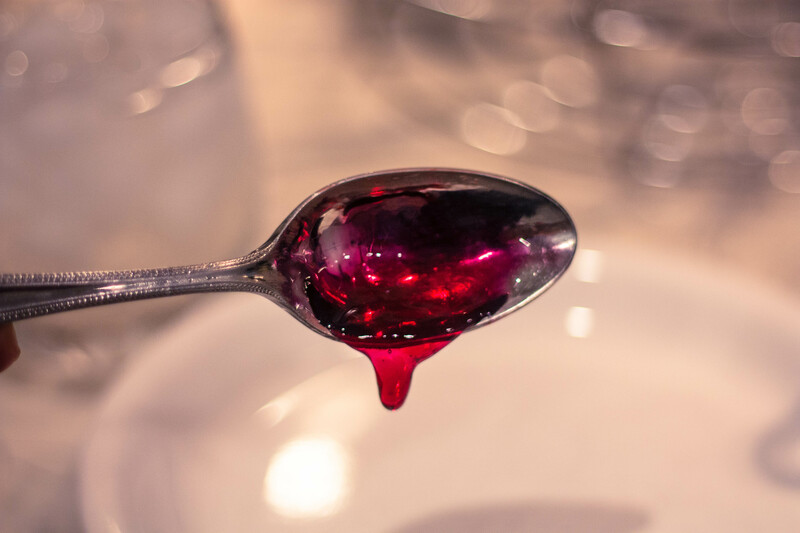 If you pour the hot jelly into the soap and water washed jelly jars, tighten the lid down tight and invert the jar for 5 minutes, it will kill any bacteria that slipped into the jar. After 5 minutes, turn the jar right side up and listen for the lid to “pop”, indicating that jar is vacuum sealed. Then adjust the lid to make sure it’s good and tight. When I was young, too, we used to pour hot paraffin on top of the jelly before installing the lid. That isn’t necessary any more. I am so looking forward to trying this recipe. I have a Mustang grape vine on the fence row across from my house near LaVernia, Texas The main vine is as big around as my wrist! Thanks for commenting Eric! I have heard of your method but was afraid I might need to boil the jars to ensure their safety. I’ve also heard of the paraffin…my grandma used to do that. I love Mustang Grape Jelly! It’s our family’s favorite. I have made Mustang Grape Jelly in the past. 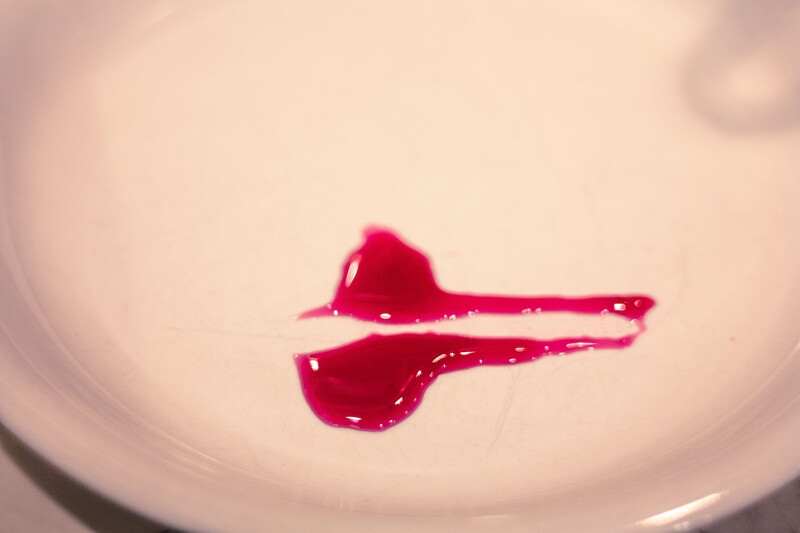 I’ve never had much luck with Sure-Jell – it doesn’t gel for me, so I use the tried and true Certo liquid pectin. Never had a problem with it! We picked a gallon or so today at a friend’s place at Tanglewood (we live in Lexington). Grape jelly here I come! Thanks for your comment! I have used the Certo liquid pectin recently and I like it too! I loved reading all the comments others and yourself Jennifer have left in the past! 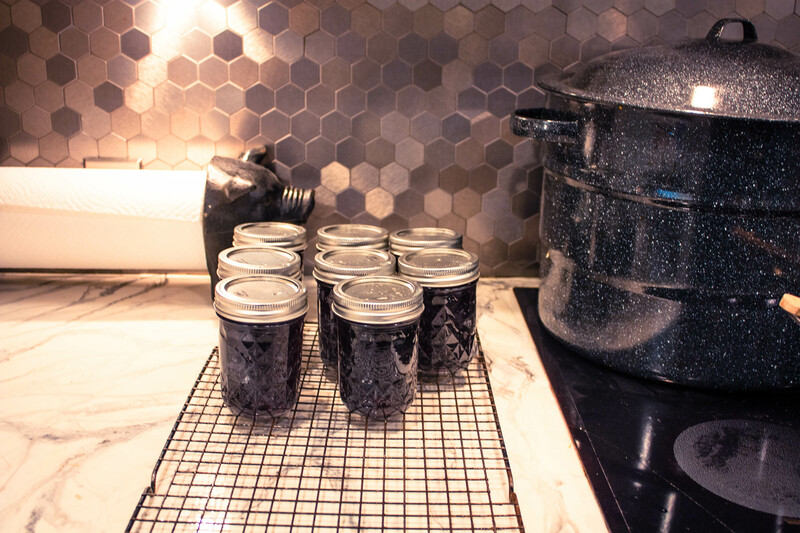 I have made Mustang Grape Jelly for years now. We live in Centerville and Houston, TX. The grapes are early this year at our ranch in Centerville. 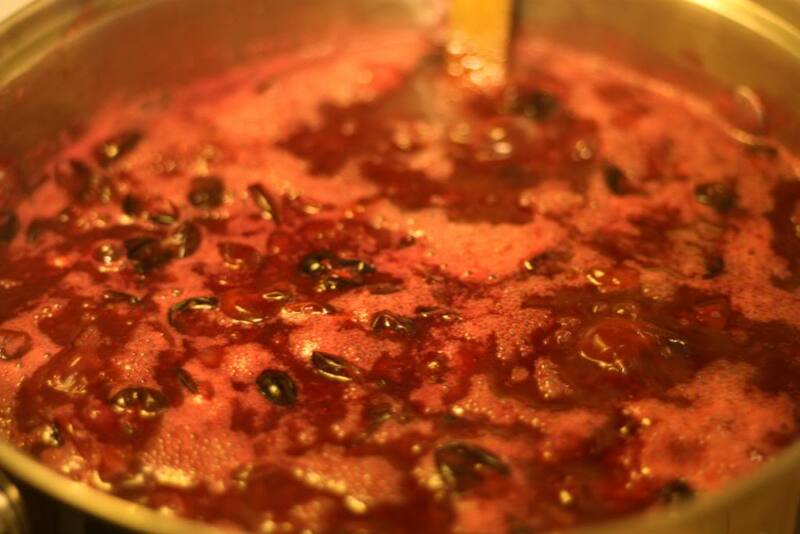 I remember heating the grape liquid and the sugar first then adding the liquid pectin. Then boiling for one minute. Yes, I am now 60 and obviously could have made a huge mistake! I have never added lemon juice. What does the lemon juice do? I have always turned upside down after a water bath. Also I have a large amount expired pectin. Should I ditch it and buy new? Hi Elizabeth! Thanks for stopping by! No…I don’t think you’ve done anything wrong, they’re all sorts of ways to go about making jelly. 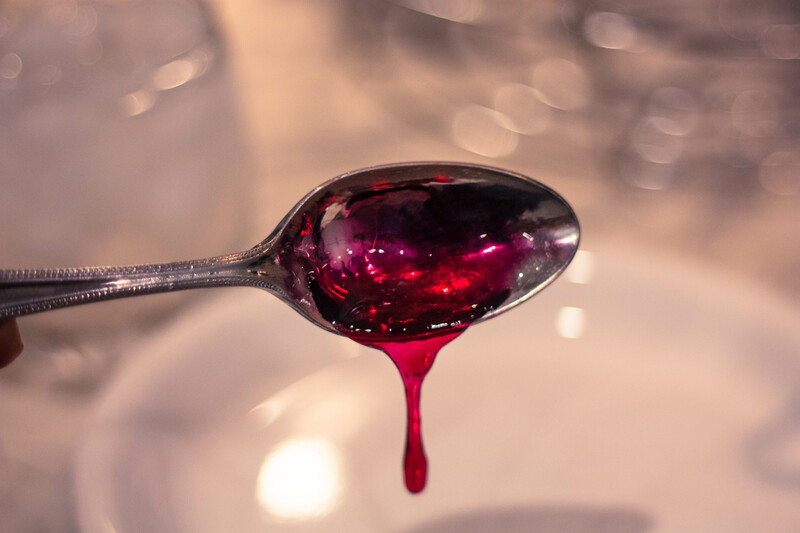 I like adding lemon juice for two reasons: one, I like the added tartness it adds to the jelly, and two, I think it helps ensure that my jelly will set. It was probably an old wives tale past down to me and I still use it in most of my jellies. Mostly, I like the added flavor. You can certainly leave it out. I’m not an expert on expired pectin and I wouldn’t really know. I would think that it would still be ok to use. You could always try it and if it doesn’t set, then re-boil the juice with new pectin. However, I’m not sure if it goes”bad” in terms of consuming it. I’m so glad you commented! 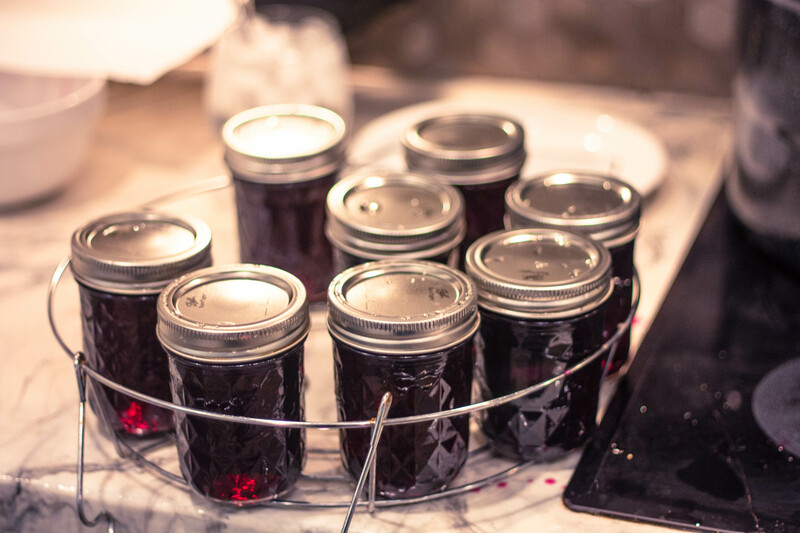 I love hearing everyone’s stories about their years of making Mustang Grape Jelly! Have you had any trouble with the white crystal stuff? I’ve had it in my grape jelly before after it sits for awhile. Any suggestions? cooking the mixture too little, too slowly, or too long. That’s about all I know about crystals in jelly. In your particular case, I’m guessing that they are tartrate crystals that formed. This is common in grape jellies (and is ok to eat). 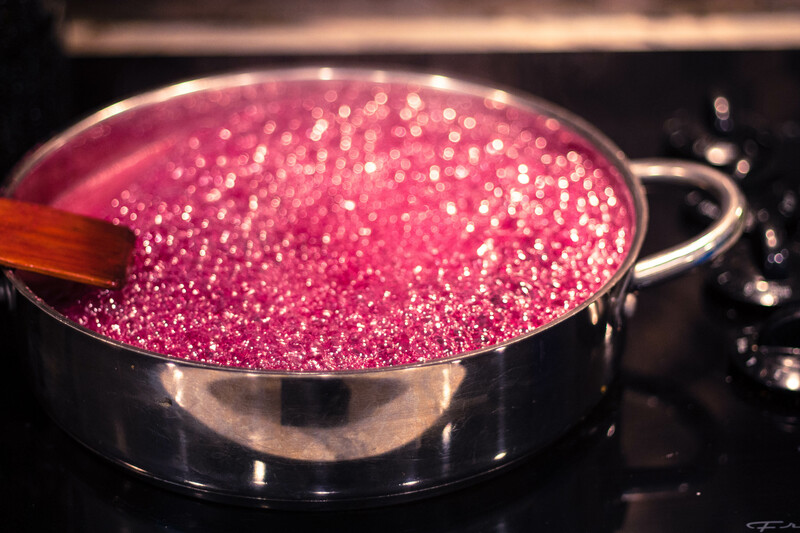 I haven’t had this happen to me, but I’ve read that after you make your grape juice, you should store it in the refrigerator 24 to 48 hours before making jelly. 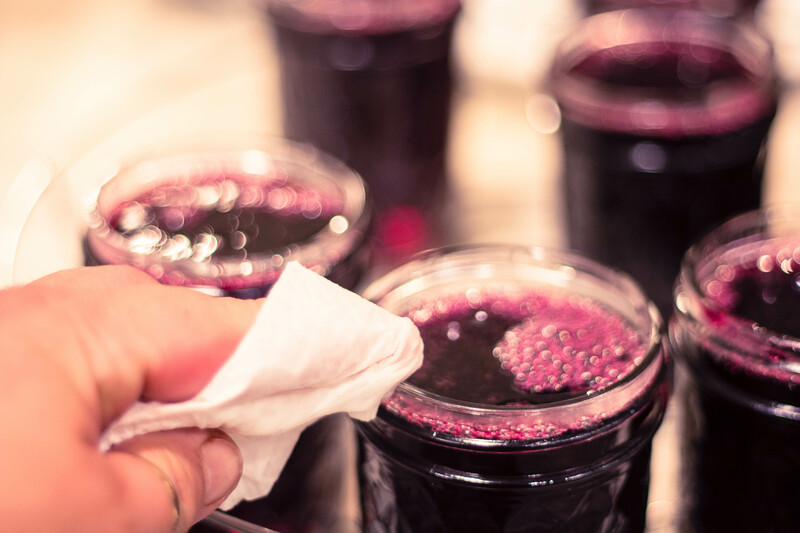 Also, after refrigerating, you should strain the refrigerated grape juice through a double layer of fine cheesecloth before using. I hope this works for you! Thank you so much for your reply. I’ve not ever heard to let sit for that long. I’m sure gonna try. I’ve got a 5 gallon bucket that is destined for jelly! I made a batch of jelly for the first time last year using your recipe and it turned out perfect. I am about to try it again but I don’t remember how many lbs of grapes I need. We also picked some wild plums, do you have a recipe for making wild plum jelly or jam? Did the first part of the recipe tonight and put it in the fridge. Am really looking forward to finishing this,my first ever attempt at making jelly. Thanks! 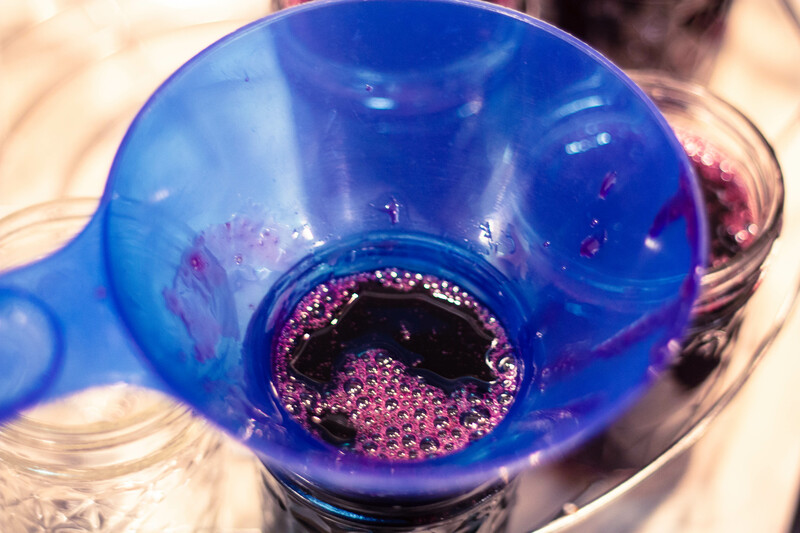 What happens if we used a wine press to make the grape juice from raw grape stems, skins, seeds, then refrigerated the juice immediately over night? Hi Diana! Thanks for dropping by and leaving a comment. I don’t think a wine press to make the grape juice will make a difference in the final product. Refrigerating the juice overnight is just fine. Also, you can freeze your juice until you’re ready to make jelly. The frozen juice will keep for up to a year in the freezer and up to 3 weeks in the refrigerator. I was looking at your recipe and was wondering. Another website added water to the boil. Is yours just straight grapes? Hi John! Thanks for dropping by. I usually add about 1/2 cup to 1 cup of water just to prevent sticking.